Napier ( ; Māori: Ahuriri) is a New Zealand city with a seaport, located in Hawke's Bay on the eastern coast of the North Island. The population of Napier is about 61,500 as of the June 2015 estimate. 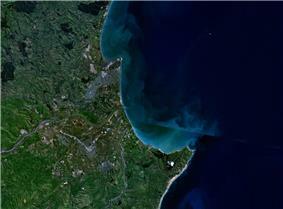 About 18 kilometres south of Napier is the inland city of Hastings. These two neighbouring cities are often called "The Bay Cities" or "The Twin Cities" of New Zealand. The total population of the Napier-Hastings Urban Area is 129,700 people, which makes it the fifth-largest urban area in New Zealand, closely followed by Tauranga (130,800), and Dunedin (117,400), and trailing the Hamilton Urban Area (224,000). Napier is about 320 kilometres northeast of the capital city of Wellington. Napier (61,500) has a smaller population than its neighbouring city of Hastings (68,200) but is seen as the main centre due to it being closer in distance to both the seaport and the main airport that service Hawke's Bay. 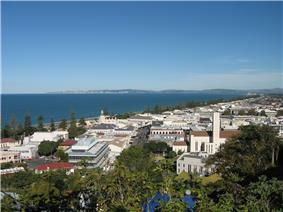 The City of Napier has a land area of 106 square kilometres and a population density of 540.0 per square kilometre. Napier is the nexus of the largest wool centre in the Southern Hemisphere, and it has the primary export seaport for northeastern New Zealand – which is the largest producer of apples, pears, and stone fruit in New Zealand. Napier has also become an important grape and wine production area, with the grapes grown around Hastings and Napier being sent through the Port of Napier for export. Large amounts of sheep's wool, frozen meat, wood pulp, and timber also pass through Napier annually for export. Smaller amounts of these materials are shipped via road and railway to the large metropolitan areas of New Zealand itself, such as Auckland, Wellington and Hamilton. Napier is a popular tourist city, with a unique concentration of 1930s Art Deco architecture, built after much of the city was razed in the 1931 Hawke's Bay earthquake. It also has one of the most photographed tourist attractions in the country, a statue on Marine Parade called Pania of the Reef. Thousands of people flock to Napier every February for the Tremains Art Deco Weekend event, a celebration of its Art Deco heritage and history. Other notable tourist events attracting many outsiders to the region annually include F.A.W.C! Food and Wine Classic events, and the Mission Estate Concert at Mission Estate and Winery in the suburb of Taradale. Napier has well-documented Māori history. When the Ngāti Kahungunu party of Taraia reached the district many centuries ago, the Whatumamoa, Rangitane and the Ngāti Awa and elements of the Ngāti Tara iwi existed in the nearby areas of Petane, Te Whanganui-a-Orotu and Waiohiki. Later, the Ngāti Kahungunu became the dominant force from Poverty Bay to Wellington. They were one of the first Māori tribes to come in contact with European settlers. Chief Te Ahuriri cut a channel into the lagoon space at Ahuriri because the Westshore entrance had become blocked, threatening cultivations surrounding the lagoon and the fishing villages on the islands in the lagoon. The rivers were continually feeding freshwater into the area. Captain James Cook was one of the first Europeans to see the future site of Napier when he sailed down the east coast in October 1769. He commented: "On each side of this bluff head is a low, narrow sand or stone beach, between these beaches and the mainland is a pretty large lake of salt water I suppose." He said the harbour entrance was at the Westshore end of the shingle beach. The site was subsequently visited and later settled by European traders, whalers and missionaries. By the 1850s, farmers and hotel-keepers arrived. The Crown purchased the Ahuriri block (including the site of Napier) in 1851. In 1854 Alfred Domett, a future Prime Minister of New Zealand, was appointed as the Commissioner of Crown Lands and the resident magistrate at the village of Ahuriri. It was decided to place a planned town here, its streets and avenues were laid out, and the new town named for Sir Charles Napier, a military leader during the "Battle of Meeanee" fought in the province of Sindh, India. Domett named many streets in Napier to commemorate the colonial era of the British Indian Empire. Napier was designated as a borough in 1874, but the development of the surrounding marshlands and reclamation proceeded slowly. Between 1858 and 1876 Napier was the administrative centre for the Hawke's Bay Province, but in 1876 the "Abolition of Provinces Act", an act of the New Zealand Parliament, dissolved all provincial governments in New Zealand. Development was generally confined to the hill and to the port area of Ahuriri. In the early years, Napier covered almost exclusively an oblong group of hills (the Scinde Island) which was nearly entirely surrounded by the ocean, but from which ran out two single spits, one to the north and one to the south. There was a swamp between the now Hastings Street and Wellesley Road and the sea extended to "Clive Square". On 3 February 1931, most of Napier and nearby Hastings were levelled by an earthquake. The collapses of buildings and the ensuing fires killed 256 people. 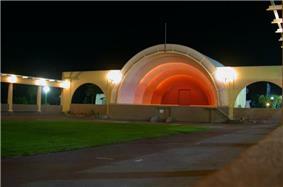 The centre of the town was destroyed by the earthquake, and later rebuilt in the Art Deco style popular at that time. Some 4000 hectares of today's Napier were undersea before the earthquake raised it above sea level. The earthquake uplifted an area of 1500 km2 with a maximum of 2.7 m of uplift. In Hastings about 1 m of ground subsidence occurred. Although a few Art Deco buildings were replaced with contemporary structures during the 1960s, 1970s, and 1980s, most of the centre remained intact for long enough to become recognised as architecturally important, and beginning in the 1990s it had been protected and restored. Napier and the area of South Beach, Miami, Florida, are considered to be the two best-preserved Art Deco towns (with the town of Miami Beach, Florida, being mostly decorated in the somewhat later Streamline Moderne style of Art Deco). 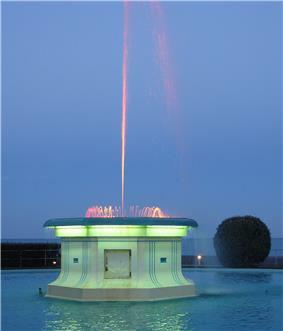 Beginning in 2007, Napier was nominated as a World Heritage Site with UNESCO. This is the first cultural site in New Zealand to be so nominated. In January 1945, the German Kriegsmarine U-boat (submarine) U-862 entered and departed from the port of Napier undetected. This event became the basis of a widely circulated postwar tall tale that the captain of this U-boat, Heinrich Timm, had led crewmen ashore near Napier to milk cows to supplement their meagre rations. Napier was the scene of an armed attack by cannabis dealer Jan Molenaar on three police officers searching his home in May 2009. He killed one officer, and wounded two others and a civilian. He continued to fire shots from his house, which police besieged until he committed suicide 40 hours later. The city is on Napier Hill and the surrounding Heretaunga Plains at the southeastern edge of Hawke Bay, a large semi-circular bay that dominates the east coast of New Zealand's North Island. The coastline of the city was substantially altered by a large earthquake in 1931. The topography puts Napier in danger from a tsunami, as the centre of the commercial city is near sea level – should the sea ever crest Marine Parade the sea would run through to Ahuriri. Furthermore, by virtue of its pre 1931 existence, the bulk of Napier is susceptible to earthquake liquefaction, the risk classed as Very High for the main urban area excluding the hill. Suburbs of Napier include: Ahuriri; Awatoto; Bay View; Bluff Hill; Eskdale; Greenmeadows; Hospital Hill; Maraenui; Marewa; Meeanee; Napier CBD; Napier South; Onekawa; Pandora; Pirimai; Tamatea; Taradale; and Westshore. Under the Köppen climate classification, Napier has an oceanic climate (Cfb). The climate is warm and relatively dry resulting from its location on the east coast of the North Island. Most of New Zealand's weather patterns cross the country from the west, and the city lies in the rain shadow of the North Island Volcanic Plateau and surrounding ranges such as the Kaweka Range. At the 2013 census, Napier had a population of 57,240, an increase of 1881 people, or 3.4 percent, since the 2006 census. There were 23,064 occupied dwellings, 1668 unoccupied dwellings, and 63 dwellings under construction. Of the population of Napier, 27,024 (47.2 percent) were male, and 30,216 (52.8 percent) were female. The city had a median age of 41.6 years, 3.6 years above the national median age of 38.0 years. People aged 65 years and over made up 18.6 percent of the population, compared to 14.3 percent nationally, and people under 15 years made up 20.2 percent of the population, compared to 20.4 percent nationally. Napier's ethnicity was made up of (national figure in brackets): 83.2 percent European (74.0 percent), 19.2 percent Maori (14.9 percent), 3.5 percent Asian (11.8 percent), 3.1 percent Pacific Islanders (7.4 percent), 0.5 percent Middle Eastern/Latin American/African (1.2 percent), 2.1 percent 'New Zealanders' (1.6 percent), and 0.1 percent Other (0.0 percent). Napier had an unemployment rate of 6.9 percent of people 15 years and over, compared to 7.1 percent nationally. The average annual income of all people 15 years and over in Napier was $26,000, compared to $28,500 nationally. Of those, 38.9 percent earned under $20,000 annually, compared to 38.2 percent nationally, while 22.1 percent earned over $50,000 annually, compared to 26.7 percent nationally. Napier's major tourist attraction is its architecture, which draws Art Deco and architecture enthusiasts from around the world. The rebuilding period after the 1931 earthquake coincided with the short-lived and rapidly changing Art Deco era and the Great Depression, when little "mainstreet" development was being undertaken elsewhere. As a result, Napier's architecture is strikingly different from any other city; the other notable Art Deco city, Miami Beach, has Streamline Moderne Art Deco. The whole centre of Napier was rebuilt simultaneously. Other tourist attractions in Napier include MTG Hawke's Bay (the museum, art gallery and theatre) which features information on both the 1931 earthquake and Napier's redesign as an Art Deco city, the National Aquarium, the Napier Prison, the Soundshell and the Pania of the Reef statue. 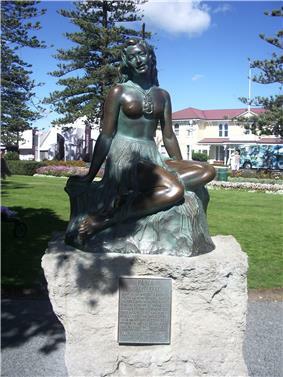 The Pania statue on Marine Parade is regarded in Napier in much the same way that the Little Mermaid statue is regarded in Copenhagen. In October 2005 the statue was stolen, but it was recovered a week later, largely unharmed. Marineland was a tourist attraction from 1965 until it closed in 2009. The National Aquarium is one of the foremost aquariums in New Zealand. The historic Napier Prison is the oldest prison in New Zealand and visitors can learn about the history of prisons as well as witness the path of the 1931 Earthquake. It is the only place in Napier where some of the earthquake damage has been left in place. Tourists flock to Napier in February for Art Deco weekend and the Mission Estate Winery Concert in the Napier suburb of Greenmeadows which has featured Chris De Burgh, Olivia Newton-John, Eric Clapton, Kenny Rogers, Ray Charles, Rod Stewart, Sting performing with the NZ Symphony Orchestra, Shirley Bassey, Beach Boys, Doobie Brothers, Tom Jones, and in 2013 Barry Gibb with Carol King. Attractions nearby include the Cape Kidnappers Gannet Colony and many vineyards bordering Taradale, Hastings City, and north of Napier around Bay View and the Esk Valley. Many people use Napier as a gateway to Hawke's Bay, flying in to Hawke's Bay Airport at Westshore from Wellington City, Auckland and Christchurch. Tourists also enter Napier by State Highway 2 along the coast and State Highway 5 from Taupo. The rail line in and out of Hawke's Bay has not had a passenger service since 2001. The largest industry in Napier and its environs is processing/manufacturing, the major products being food, textiles, wood, metal products and machinery/equipment. Other significant industries for the region include property/business services, rural production/rural services and retail. 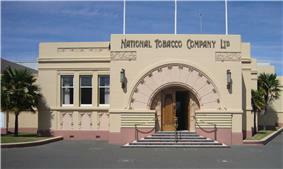 Napier was once home to one of New Zealand's largest smoking tobacco plants. On 9 September 2005 British American Tobacco announced it would close the Rothmans factory, due to diminished demand. Production has moved to Australia. The Art Deco-style factory had been producing up to 2.2 billion cigarettes a year for the New Zealand and Pacific Island markets. In March 1999, 19 people lost their jobs there because "fewer people are smoking". Napier suffered a double blow from service amalgamation towards the end of the century. The local newspaper, the (Napier) Daily Telegraph, was combined with the (Hastings) Herald-Tribune to form a new regional newspaper Hawke's Bay Today. The Napier offices were closed down in favour of locating the offices in Hastings. The next rationalisation saw the closure of Napier Hospital, with services being amalgamated with Hastings Hospital, creating Hawke's Bay Hospital at the Hastings site. 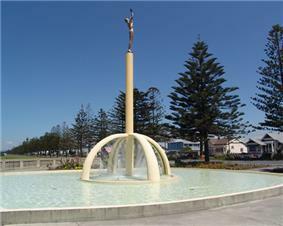 Local government reform was mooted in the late 1990s and a referendum was held in 1999 proposing an amalgamation of the Hastings District Council with the Napier City Council. Although supported by approximately two-thirds of Hastings voters, Napier voters rejected the proposal by a similar number and the proposal was defeated. The National Government amended the Local Government Act in 2012 to determine a reorganisation proposal by a majority vote over the entire proposed area, rather than a majority over each existing area as was previously the case. Yet another change was to allow private submissions to the commission to trigger the process, whereas previously only local councils themselves could request a change in structure or boundary. The legislative restrictions on councils using public funds to support or challenge a final proposal did not apply to private lobby groups or individuals however. After a lengthy and divisive regional campaign to restructure local government in Hawke's Bay, in 2015 the Local Government Commission put forward a final reorganisation proposal to amalgamate Napier City Council with Wairoa District Council, Hastings District Council and Central Hawke's Bay District Council to form a proposed 'Hawke's Bay Council'. A postal ballot was established to maximise voter returns, and the vote closed on 15 September 2015. An interim count was available later that day, that saw the proposal defeated across the region by about 66%. In Napier the proposal was rejected by 84% of voters. Hawke's Bay Airport, due to be renamed Ahuriri Airport Hawke's Bay in October 2017, serves as the domestic airport in the Hawke's Bay region. It is jointly owned by the government, Napier City Council, and Hastings District Council, and is operated by Hawke's Bay Airport Ltd. The airport is located in the Napier suburb of Westshore. Regular domestic flights between Auckland, Wellington and Christchurch are serviced by Air New Zealand, while smaller charter companies such as Air Napier and Sunair serve other smaller New Zealand cities. International flights to the airport often come in the form of private charter flights. The airport was historically referred to as Napier Airport, and is situated on land that was formerly the Ahuriri Lagoon, an area that was raised above sea level by the massive 1931 Napier earthquake. The airport is located approximately 22 km north of Hastings Aerodrome, a smaller airport located close to Hastings that caters mainly for flight training and general aviation. The Hawke's Bay region has extensive cycleways and footpaths that originally began as the 'Rotary Pathways' between Napier and Hastings, and is now known as the 'Hawke's Bay Trails'. The network of pathways link the urban areas of Napier and Hastings, as well as many of the other outlying suburbs of the two cities. Some of the cycleways include dedicated cycling lanes on roads within the city, as well as separate dedicated pathways on roadsides and through parks and other areas, many of which are mixed use pathways for cyclists and pedestrians, such as the paths that stretch from Bay View to Clifton. The Hawke's Bay Trails contain over 200 km of cycleways that meander through and around the Napier-Hastings twin cities. The Napier Rotary Pathway creates a loop that encompasses the city from Esk River, to Westshore, Napier Central, Awatoto, Taradale, Poraiti, and looping back to the Esk Valley. This rotary also has several links to the Hastings Rotary Pathway. Napier is served by State Highway 2, which connects it to Wairoa and Gisborne to the north, and, via Dannevirke, to Wellington, Masterton and Palmerston North to the south. SH2 enters Napier from the north along the coast from Bay View. It passes Hawke's Bay Airport, and follows Meeanee Quay through the suburbs of Westshore and Ahuriri, bridging across the Pandora Pond area of the Napier Inner Harbour marina, becoming Pandora Road. 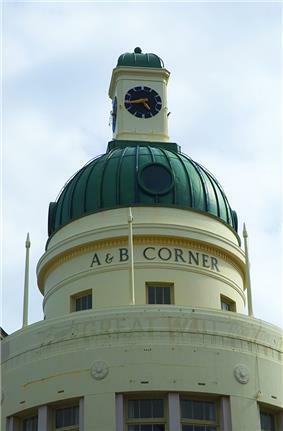 It then follows the western and southern base of Napier Hill onto Georges Drive, where it borders the southern and western edges of the Napier city centre. 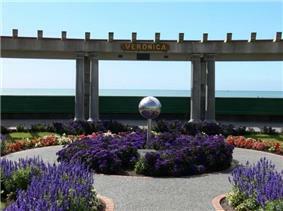 It meets up with Marine Parade south of the CBD, and follows the coast south from Napier through Clive to Hastings. State Highway 5, known as the Napier-Taupo Road, begins at a junction just north of the Napier suburb of Bay View, and connects Napier and the Hawke's Bay to Taupo and the central North Island. It is also the main route used for traffic travelling from Napier-Hastings to Auckland, Hamilton, Rotorua and Tauranga, as it is quicker than the route through Gisborne taken by SH2. Napier is connected to Hastings through the Hawke's Bay Expressway, also known as the Napier-Hastings Expressway, providing a more direct and efficient link between the two cities compared to SH2, and better access to Hawke's Bay Airport. The expressway also provides a more direct and efficient route to the Port of Napier for heavy vehicles traffic coming from the south, as it allows them to avoid travelling through the Hastings urban area. The expressway has connections to many of Napier's arterial roads that lead to the city centre and the Port, such as the junctions at Kennedy Road, Taradale Road, Prebensen Drive and Meeanee Quay. While State Highways 2 and 5 connect Napier to other major centres in New Zealand, State Highway 50 connects Napier to the southwestern Hawke's Bay, going through many small settlements. It also connects Napier to many of Hawke's Bay's wineries, of which the region is well known for. It makes up part of the Hawke's Bay Wine Trail. The Palmerston North–Gisborne Line runs through Napier. The southern portion of the line between Napier and Palmerston North was built between 1872 and 1891, and the northern portion between Napier and Gisborne from 1912 to 1942. The line from Gisborne enters Napier via the coast, making its way through the city, before eventually turning inland towards Hastings, and onwards to Woodville (where the Wairarapa Line branches off) and Palmerston North. The Manawatu Gorge to Palmerston North and hence to Wellington was opened on 9 March 1891. The line north of Napier to Gisborne was opened on 3 August 1942, with passenger services from 7 September. Napier was the terminus for both Gisborne and Wellington goods trains, though some passenger trains ran straight through. The original Napier station building was on the corner of Station Street and Millar Street, close to the centre of Napier. The facilities on the site increased to include the passenger station plus a goods yard, locomotive depot, workshop and a way and works branch. The line was on a curve and difficult to work, and the site was limited by level crossings at each end and with no room for expansion. Hence in a two-year programme to 1991 most functions followed the Way and Works to Pandora Point, at the start of the Ahuriri Branch, leaving only a new InterCity coach and train terminal on the city site, fronting Munroe Street. The old station was closed on 6 October 1990, and was replaced by a new station on 9 June 1991. The existing station and three-story administrative block built in the late 1950s and early 1960s were demolished and some three hectares of land was available for retail development. A marshalling yard, freight terminal, locomotive depot and other facilities were established at Pandora Point, with a triangle provided to turn trains and giving direct access north and south from the port branch. The Ahuriri yard was closed. The old main line north to Gisborne was realigned to the east to allow a new link road to the Tamatea area of Napier, and railways land was redeveloped as an industrial subdivision. On 7 October 2001 the Bay Express from Wellington to Napier was cancelled and passenger services on the line ceased. Napier markets itself as the Art Deco Capital. Its Mediterranean climate supports a vibrant café culture, and excellent cuisine. Wine is important in the whole Hawke's Bay region, which is renowned for producing some of the world's finest wines, with over 70 wineries located in the area. The region featured in Wine Enthusiast Magazine as one of the 10 Best Wine Travel Destinations in 2015. The region is New Zealand's largest apple, pear and stone fruit producer. 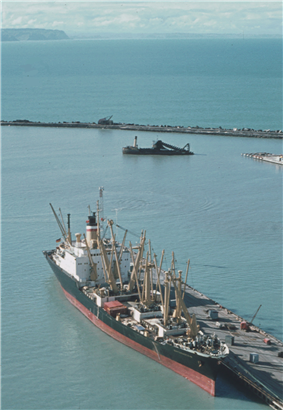 The Port of Napier and rail network provides quick export of these goods. Entertainment in Napier is vibrant and varied. Tourists flock to the city for its attractions and activities, and a large attraction is the Art Deco building designs. Marine Parade is one of Napier's most famous highlights – a tree-lined ocean boulevard with fountains, gardens, mini golf, statues and spas. The National Aquarium of New Zealand is located on the south end of Marine Parade. The historic Napier Prison is located off the northern end of Marine Parade. Recent redevelopments of Marine Parade have seen the addition of shaded picnic areas and playgrounds. 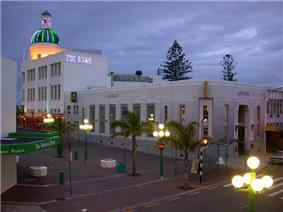 Napier has a large number of hotels and accommodation providers compared to other New Zealand cities of similar size. Napier has a lively entertainment scene that includes many outdoor and indoor activities such as city tours, swimming, golf, sports, restaurants, theatres, and a thriving nightlife scene. Napier's theatre scene includes productions put on by the Napier Operatic Society, based at the Tabard Theatre and putting on musicals at the Napier Municipal Theatre, another notable example of Art Deco architecture. Shopping is popular – there are high street and boutique stores to browse in, as well as antique shops, art galleries, and studios of potters, wood turners and craftsman. Sailing, fishing and other water activities in the Bay are popular. The marina and waterfront in Ahuriri, Napier, is a popular sea-tourism attraction. Fishing industries are thriving in Napier. On hot "Hawke's Bay days" swimming and family activities are popular in Pandora Pond – a salt water inlet by the inner harbour in Ahuriri – or on the beaches and playgrounds of Marine Parade, Westshore and Ahuriri. The many rivers that flow through the region are used for water activities, such as jet boating, jet skiing, rowing, kayaking, fishing, whitebaiting and swimming. Cycling and walking are popular activities in the region. Development of the region's cycleways and walkways have included dedicated cycle lanes being established on urban streets in the Napier-Hastings urban areas, as well as a large variety of off-road pathways, which are often used as mixed use pathways for cyclists and pedestrians, such as the paths that stretch from Bay View to Clifton. The Hawke's Bay Trails contain over 200 km of cycleways that meander through and around the cities, and link the Napier-Hastings urban areas with surrounding suburbs and the local district. McLean Park is the main sporting venue in Hawke's Bay. The main sports played at the venue are cricket and rugby union. It is one of ten proper cricket grounds in New Zealand. It was used to host matches during the 1987 Rugby World Cup, the 2011 Rugby World Cup and the 2015 Cricket World Cup. For flying enthusiasts, the annual model aircraft show 'Warbirds over Awatoto' takes place on the outskirts of Napier. The 2013 gathering attracted 48 pilots and 120 planes. Napier has five state secondary schools: Napier Boys' High School, Napier Girls' High School, William Colenso College, Tamatea High School and Taradale High School. Other secondary schools include Sacred Heart College and St Joseph's Māori Girls' College, both state integrated Catholic girls' schools, and Te Kura Kaupapa Māori o Te Ara Hou, a Māori language immersion school. The Eastern Institute of Technology in Taradale is the main tertiary education provider for Napier and the Hawke's Bay. Napier City Council recognises three sister city relationships. ^ a b c d "History". napier.govt.nz. 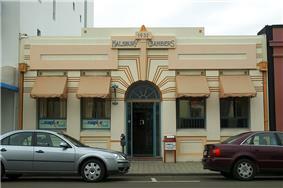 ^ Napier Art Deco historic precinct. UNESCO World Heritage Centre. Retrieved on 7 May 2012. ^ "Napier shooting: Siege over as Molenaar's body located". ^ "Tsunami Evacuation Zones". intramaps.co.nz. ^ "End of an era as Napier's Marineland closes". ^ Napier City Economic and Tourism Update 16 March 2011 Retrieved 31 March 2011. ^ Napier City Economic Trends and Outlook March 2010 Update Report Retrieved 31 March 2011. ^ July 1999 decisions. Canterbury.cyberplace.org.nz. Retrieved on 7 May 2012. ^ a b "Airport's 'historic' renaming". The New Zealand Herald. ^ "Hawke's Bay Trails". NZ Cycle Trail. ^ "Wine Travel Destination 2015: Hawkes Bay, New Zealand". winemag.com. ^ a b "Napier". Hawke's Bay. Retrieved 2 August 2015. ^ "Warbirds over Awatoto". Model Flying Hawkes Bay. Retrieved 11 April 2013. ^ "Sister City Linkages". Napier City Council. Archived from the original on 8 February 2013. Retrieved 25 May 2012.